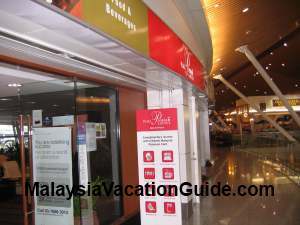 Kuala Lumpur International Airport or KLIA is the airport in Kuala Lumpur that full fledged carriers use. Hence, if you are not taking "no-frills" airlines such as AirAsia, AirAsia X or Tiger Airways, you will land and depart from this airport. If you are taking budget airlines such as AirAsia, Lion Air or Tigerair, you will be using the new KLIA2 airport which is located just beside KLIA. KLIA2 is now open for use since 2 May 2014. The KLIA is one of the most modern airport in this region and it was officially inaugurated on 27 June 1998. There are basically three main buildings. They are the Main Terminal Building, Contact Pier and Satellite Building. 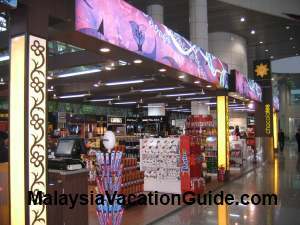 Duty free shop at the Kuala Lumpur International Airport. The KLIA Main Terminal Building is the the place where you do your check-in with up to 216 counters at the Departure level. Duty free shops, foreign exchange counters and restaurants are available for your convenience. 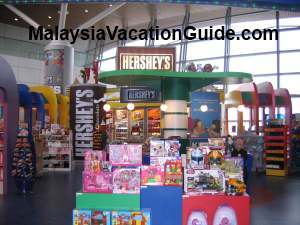 KFC Restaurant, McDonald, Eden, Food Garden, Food Paradise and Secret Recipe are some of the food and beverages outlets that you can try while checking in. Wines, chocolates, souvenirs and other goods are also available for you to browse and shop while you are at the building. If you are taking long-haul international flights, you will need to take the aero-train from this terminal to the KLIA Satellite Building. Plenty of souvenirs to choose from before you depart Malaysia. The Contact Pier serves as the domestic terminal as well as some regional international terminal. This is also the location where you board the Aero-train to the Satellite Building. Taking the aero-train is free of charge and the duration is 3 minutes. The frequency of train is about 3 minutes. There are less shops and restaurants here. The main food and beverages outlets are Old Town White Coffee, Harrods Coffee House and Starbucks Coffee. Duty Free Shopping Mall is located here for your last minute shopping needs. The Satellite Building has many gates that cater for international departures. 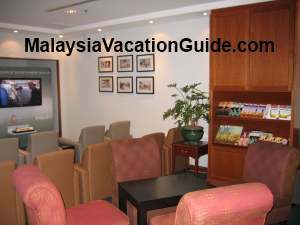 Most of the major airlines lounges such as MAS Golden Lounge, Cathay Pacific Lounge, Dynasty Lounge, Emirates Lounge, Thai Airways Lounge, Singapore Airlines Lounge are located here. There are many more restaurants and duty free shops on this building. You can now check the arrival and departure of flights in KLIA online at the comfort of your home. 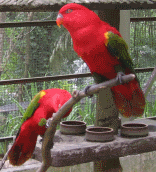 This schedule is provided by Malaysia Airport, the operator of the airport. Check it here. The Plaza Premium Lounge at Kuala Lumpur International Airport. The lounge is equipped with facilities such as shower, spa, lounge, food & beverages, internet computers and TV. Many credit cards companies provide complimentary use of the lounge for their members. If you are holding a Citibank Rewards credit card, you are entitled to use the lounge free of charge. CIMB Preferred Card members are also entitled for complimentary use of this lounge. Check out with your credit card companies and banks regarding the use of this facility. Call the lounge at Tel : +60 3 8787 2323 for more information. 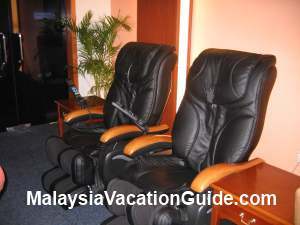 The massage chairs for your use at the lounge. If you intend to leave your luggage at the Kuala Lumpur International Airport, you can do so at the KLIA Left Luggage which is located at the Satellite Building using Smart Lockers and the Main Terminal Building Arrival Hall, Level 3. Protect your check-in bags from being damaged by wrapping them. 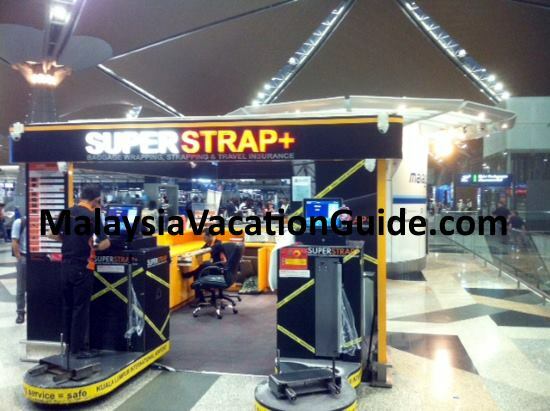 There is a service kiosk called SUPERSTRAP+ which is located at the departure hall of the airport. Price starts from about RM14 per bag. Machine operated bag wrapping service. If you are driving to the Kuala Lumpur International Airport and prefer to park your car here, you can do so at the many car park bays. If you intend to park less than 3 days, go for the Short-Term Car Park at Block B and Block C. The rate is RM4.00/hour for the first 3 hours, RM3.00/hour for the fourth and fifth hour, RM2.50 from sixth to ninth hour and RM2.00 for ninth hour onwards. The charge per day is RM46.00. If you are parking for at least 4 days, go for the Long-Term Parking at Block A. It will cost you RM144.00 for the first 4 days. Subsequent charge per day is RM15.00. You will need to use the chip coins to enjoy this rate. There are about 530 parking lots here. All parking are 24 hours operated and are fully gated. Chip Coins are used and as with any parking facilities, parking here is at your own risk hence it is always a good idea to lock your vehicle and remove any valuables from the car. If you intend to take a taxi on arrival at the terminal, head for the ticketing counters as you leave the custom declaration area. You can purchase the Budget taxi, Premier taxi (higher price) or Family coupons at these counters. The prices to Kuala Lumpur city is about RM74.30 (Budget Taxi), RM102.10(Premier Taxi)and RM199.80(Family). You will need to provide the location of your destination to the ticketing counters agents before they can give you the price. A more budget way to travel from Kuala Lumpur International Airport is by using buses. The price per person for a one way trip using Airport Coach to KL Sentral is RM10.00/adult and RM6.00/child. Tickets can be purchased at Bus Station KLIA, Ground Floor, Block C STCP. Star Shuttle goes to Pudu Sentral for RM10.00 one-way. Travellers to Ipoh and Sitiawan also have the options to take Star Shuttle buses. You can also take the ERL Train, the high speed train to KL Sentral. The non-stop KLIA Express train to KL Sentral takes about 30 minutes to arrive and costs RM55.00/adult and RM25/child. The return fares are RM100/adult and RM45/child. The KLIA Transit train stops at Bandar Tasik Selatan, Putrajaya, Cyberjaya and Salak Tinggi before reaching KL Sentral. It takes 35 minutes to arrive at KL Sentral. If you have the time, head for Mitsui Outlet Park and get branded goods before taking your flight. It is about 10 minutes away using the free shuttle pick-up.